A few strategically placed mosquito nets prevented the swarm of paparazzi from spoiling the Royal Wedding. Those entangled eventually found themselves to be a delectable complement to the hors d’oeuvres. Krista, my my this is a good work eh? Rings ding dongs for me. The colours are so harmonious, joyful, capture the essence of fairytaledom. 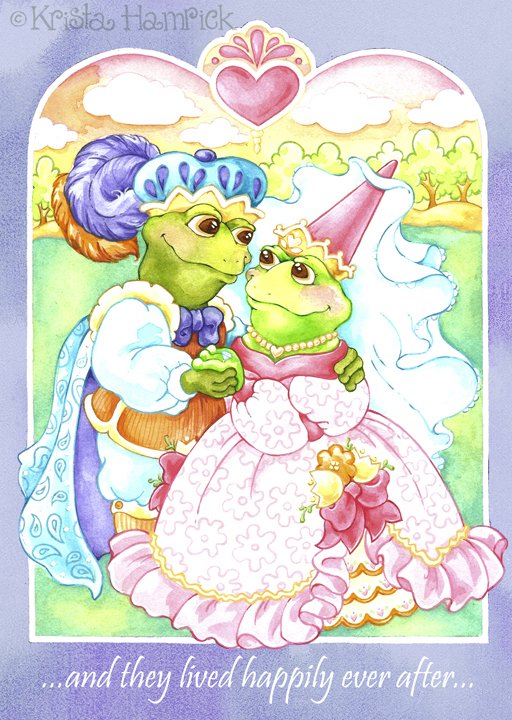 🙂 They make me want to get married again (to the same woman of course, not a frog). You are SO clever, Krista. This is perfect…love that mosquito…poor guy! And how sweet and charming are your royal pair?!! Well done! I will pass this post to a bloggerfriend who loves frogs! Never before have I been so delighted to see a mosquito! HAHAHAHAHA! Brilliant! Paparazzi certainly ARE annoying bloodsuckers. I hope the royal guests enjoy a feast tonight. You are so awesome! So cute and so clever and so funny! Very cute! Love the mosquito! WONderful interpretation. Creative on many levels! Hahahaha, love this post, that mosquito is awesome too! Krista you must have a file with an image ready for every prompt! Absolutely amazing, I love it! This is just too funny!! AAAAAHHHHHHAHAHAHAHA!!! What a riot! Hahahaha! Paparazzi mosquitos. Hahahah! 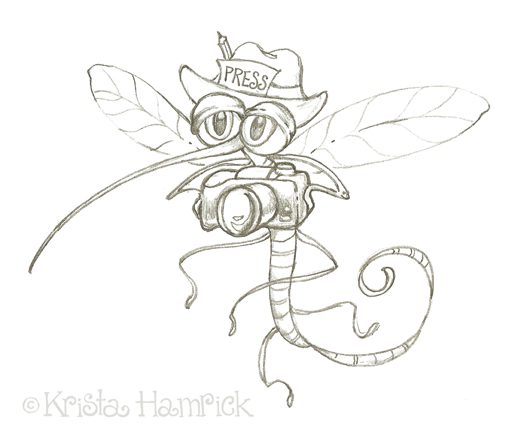 I like what’s on the mosquito’s forehead “PRESS”. HAHAHHA! I’ll press you alright. ZAT!! SPLAT!!! HAHAHA! Aaaaw! The royal couple looks so cute. What’s on the wedding reception menu? Frogs’ legs? HAHAHAHA! Okay, Krista, there is no inside joke with the Ding Dongs and bald babies. Everything is out in the open. Bella did start the Ding Dong recently but the bald babies have been there for a long time. Oh yes, Bella and I started that with a painting I did last year because we were both baldies. However, Andrew, Mita, Steve, Manon and everybody else, they just pick it up through the comments. Obviously we are having so much fun in the comments section. It ought to be criminal. Try getting arrested with us. Yes, arrested growth. Hahahaha! – Grown ups having more fun than kids do. Have a beautiful weekend! TSUP!!! oh these are so cute!!!!!!!! !